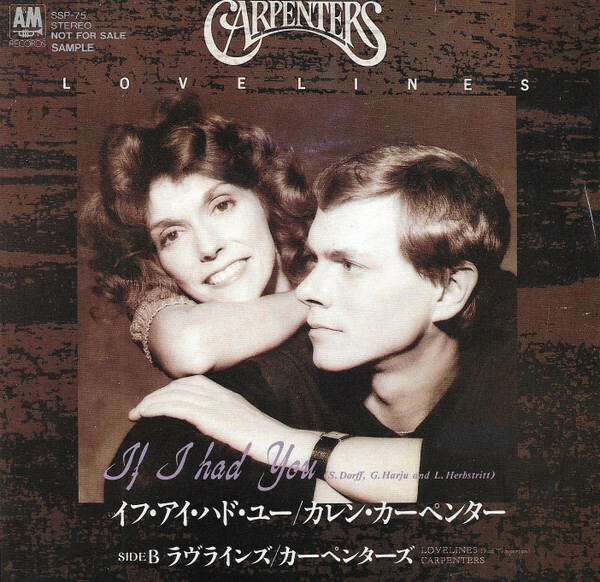 Discussion in 'A Song For You: The Carpenters Forum' started by Jarred, Feb 16, 2019. It was a Japan only release on 7" in 1989. I've always wanted to obtain it but it's pretty costly. It's nice to see Karen's name on this 45 rpm, almost like it's her single. AnnaSock, GDB2LV and John Adam like this. Thanks man! That's it, what I recall seeing. But darn, there is no time listings! And it's two Karen tracks, so it is a true KC solo single! Gotta have it. Interesting enough...the mini Japan CD Single is available now it's only $38.00 for 2 songs. Japan would have been my guess. 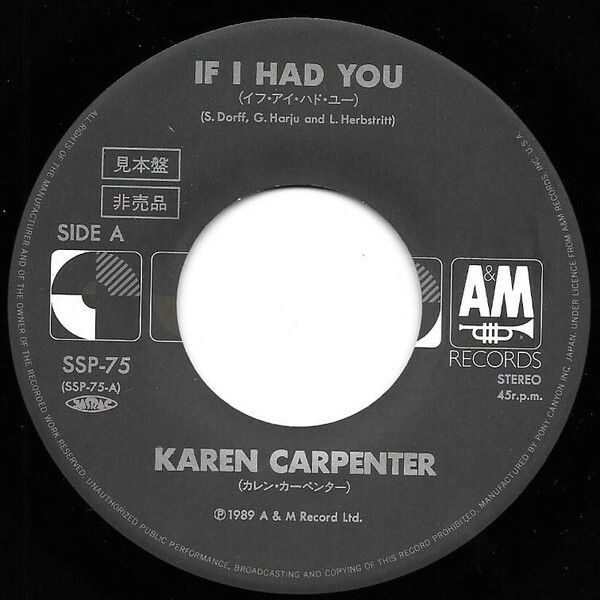 There’s another picture on line of Karen’s picture imposed in front of NYC Skyscrapers as well, with If I Had You on the 45 sleeve. Cool. I wonder if the other is a fan mock up of a fantasy sleeve for that single. I think I might of seen that too! It is, after further viewing. It's from Chris Tassin. What a sleeve that would be though! Perfection. 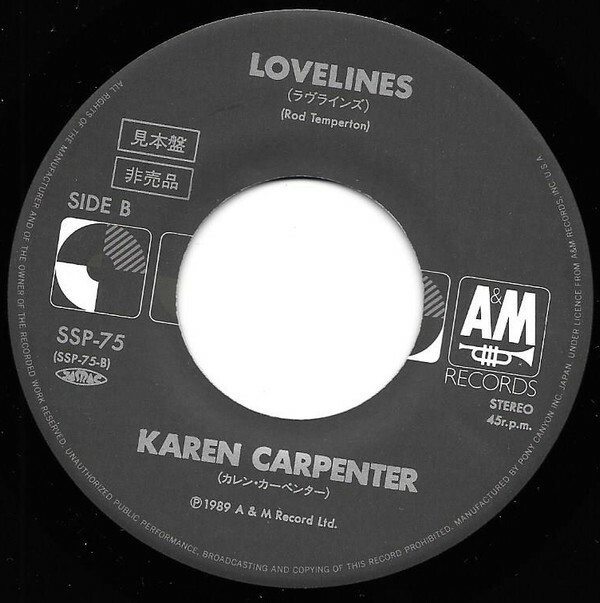 This Japan 45 rpm has to be taken from the 2 tracks on Lovelines because this record came out in 1989 and Karen's solo album wasn't released yet. True. But I wonder if there were any edits of either song exclusive to the 45? That would be coooool. GDB2LV and John Adam like this. Thanks, you're the best, and funny that is where I saw it! I lurk WAY too much! Right...I'm actually surprised that no one here has this Japan 7" and can give us the answers. John Adam and GDB2LV like this. It is definitely something to search for. Thank for all the info. From what I’ve seen, the Promo CD seems to be the most common. Even the North American cassette single is rather scarce. I'm coming late to this threat, but I just wanted to register my vote for "If We Try." The first post beautifully expresses why its my favorite song on the album. I would only add that the horn parts at the closing of the song are funky good. It reminds me of something you'd hear on a Steely Dan record, which for me is the highest form of praise. Mark-T, John Adam and AnnaSock like this. Bobberman, Rick-An Ordinary Fool, Mark-T and 2 others like this. has Karen Carpenter album scheduled for March 1980. Could you imagine if that would of happened! I wonder how we'd be talking about "Karen Carpenter" now? 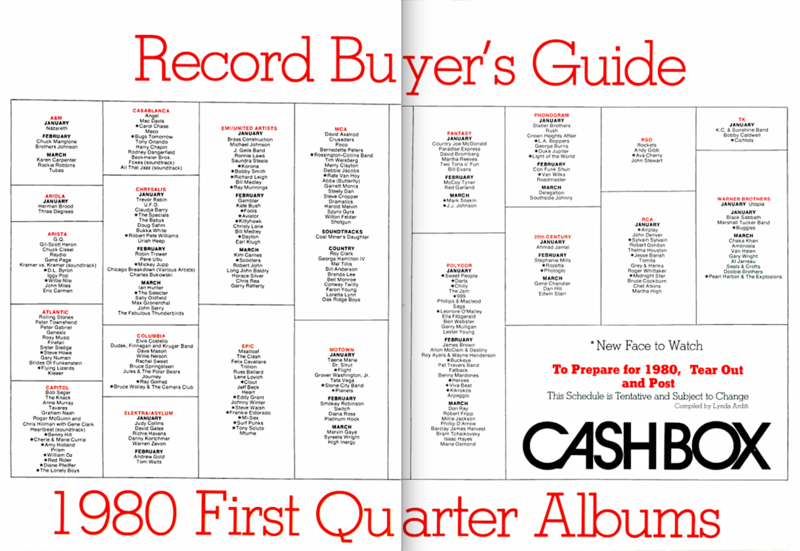 I must have missed that post from Gary but sure enough it ran Dec 29, 1979 in Cashbox Magazine. It even says these are tentative release date but still this is huge news to me. Was it closer to release than we originally thought? Sabar, ThaFunkyFakeTation, Jamesj75 and 6 others like this. Under Struggle for uptempo material Rick. Jamesj75, John Adam and Rick-An Ordinary Fool like this. Sorry Rick. He mentioned it in another thread today and I brought the quote here. Another great "find" Rick. Your resourcefulness is amazing! It's a bittersweet moment to see Karen's solo album slated for release back in 1980. I too never knew this, great find by Rick! This would tie in with the fact that the album had already been assigned a catalogue number and the A&M team were being talked up for a smash album. It really brings home how close it came to being released, sleeve design, artwork and all. What a waste. Jamesj75, Rick-An Ordinary Fool, CraigGA and 1 other person like this. It would be so meaningful to have it released as Karen approved it. there would have been a time lag between receiving information and then publishing that information. by the date of December 1979, many other wheels had to be already in motion. how could it be that the solo album was still being planned for a March release ? let alone circulating, this information--it would have been retracted before print date. Jamesj75, Rick-An Ordinary Fool and Carpe diem like this. Jamesj75 and Rick-An Ordinary Fool like this.